Theodore, a 1-to-2-year-old Dutch rabbit, was dumped at All About Rabbits Rescue. Perhaps he had been an Easter gift, and the reality of taking care of a rabbit had set in. It’s not an uncommon scenario. Theodore is one of the lucky ones because at least he wasn’t just dumped into the wild. Domestic rabbits aren’t adapted to living on their own. He has now found a home where his adopter did her research before adopting. Theodore is content in his new home. Emily Heinz wanted a pet and had initially dismissed rabbits as “messy, boring and unintelligent.” But when she learned more about them, she found out they could be litter box trained and were anything but boring. She saw Theodore on Petfinder and contacted the rescue. “My experience with AARR could not have been more amazing.” They coached her on things like basic bunny handling and nail clipping. They also steered her toward a vet that was knowledgeable about rabbits. Life with Theodore is a source of entertainment. “My partner, Cody, has a game where he’ll roll Theodore’s hay ball toward him, and Theodore will pick it up and toss it back,” Emily says. He also puts toys in his water dish. “This habit came in handy when I gave him a small, natural wicker basket to chew on; he actually started putting his toys in the basket! “He’s a surprisingly patient bunny …. He’s very social and loves to hang around and investigate people, especially if head, nose and back rubs are involved,” Emily says. 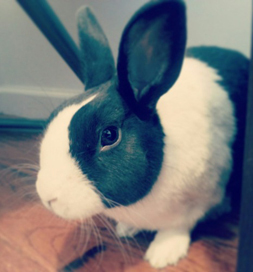 She is delighted with her decision to adopt a rabbit and is pleased that, as of June 2015, New York City has made it illegal for pet stores to sell rabbits.